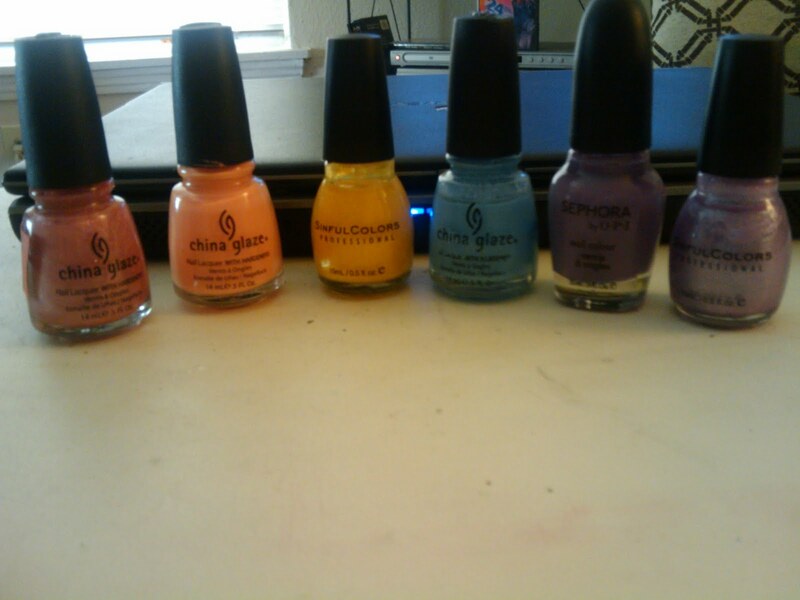 I'm obsessed with nail polish. I like wearing more than one color at a time. I decided to document my obsession. orange you glad I updated? So, I was noticing that in the summertime*, I am drawn to bright colors. It's challenging, since I work in fine dining and garish nails are generally frowned upon. I toe the line as much as I can. I started Zoya Lana. Beautiful duochrome, orange with a silver/pink glint. Love it. Then, about a week & 1/2 later, I grabbed another orange out of The Big Box o' Polish (technically, two large drawers...whatevs). Not as much duochrome, but the colors are still pretty similar. 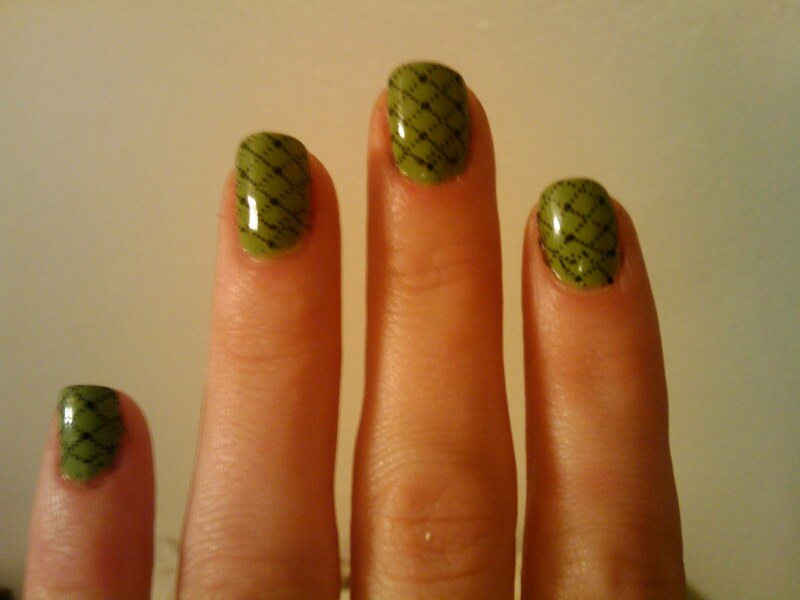 China Glaze Jamaican Out. 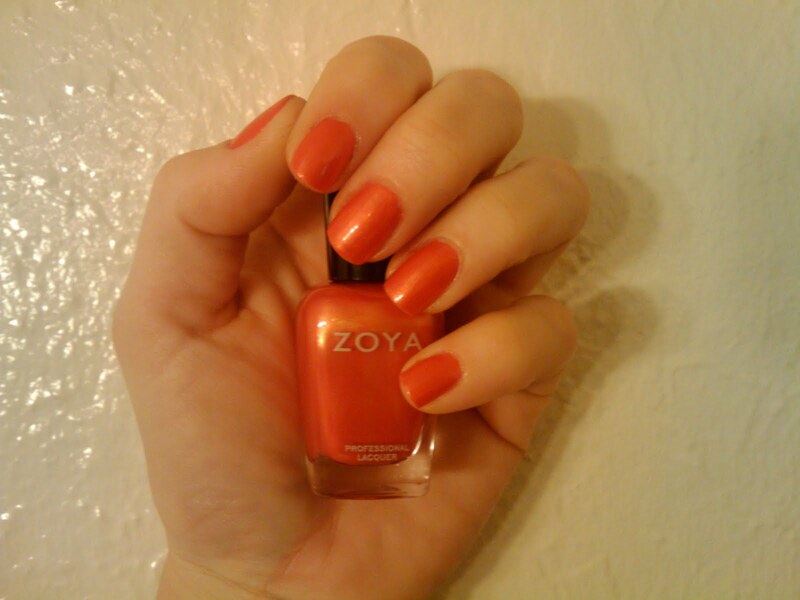 It looks much darker in the bottle than it did on my nails, but it photographs lighter than the Zoya. so, these aren't totally dupes, but they're close enough for me. I didn't do the white base coat this year. If you don't count base coat and top coat, it's only six polishes. Also, one polish is a repeater from last year, Bahamian Escape (a lovely sky blue). the colors: Chine Glaze Good Witch, CG Peachy Keen, Sinful Colors Let's Meet, CG Bahamian Escape, OPI By Sephora Iris I Was Thinner and SC Purple Diamond. I got Good Witch (it's on my unseen thumb up there) from the Wizard of Oohs and Aahs collection in the same Sally sale for $2.99, and will fully swatch it at some point. Probably in May, when I go see Wicked as it rolls through Dallas. So bright, so green, so springtime. I once again found it not looking quite complete. Konad to the rescue, again. This is a granny smith apple green. The brush is weird. And after I put the designs on, I put on a coat of Seche. 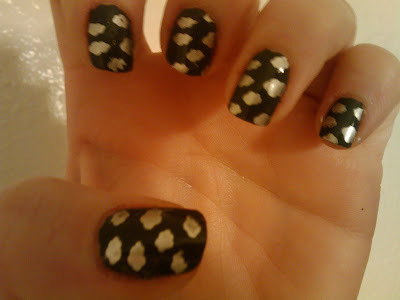 I got a lot of compliments on this particular manicure, which I rocked on a Friday night. 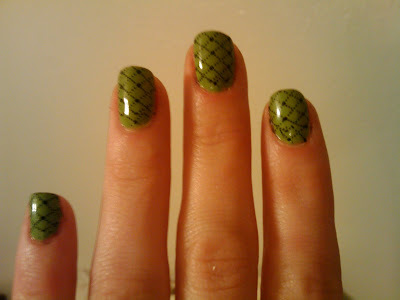 I think this is supposed to be a fishnet design, but the final effect was referred to as lizard nails. I should have fixed the index finger, but I don't think people look *that* closely at my designs. Konad m79 is totally my favorite so far. 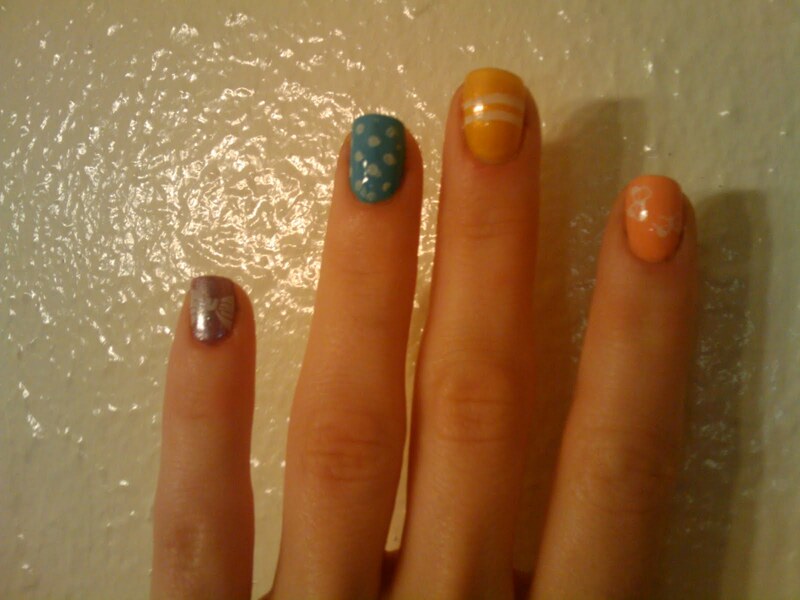 It's dots, clouds, some fishnet looking thing and pearls and flowers, all full nail designs. I went to Sally last week and snagged a couple polishes on sale. 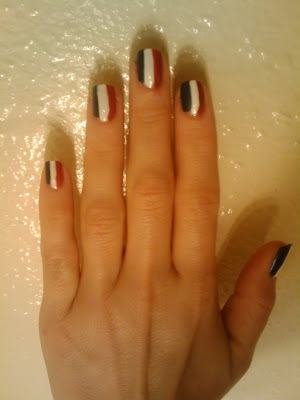 They also had an Orly Rage at the counter, which I *had* to have. 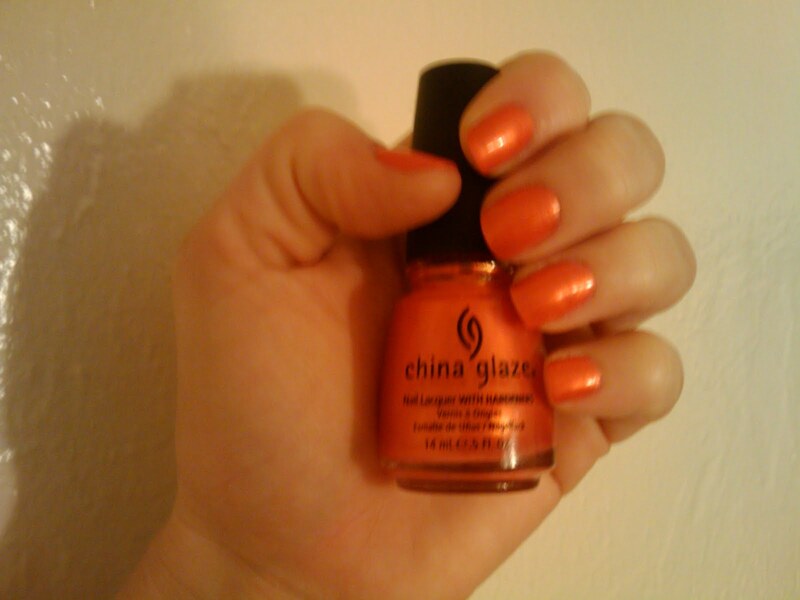 I got China Glaze VIII for $1.99. It's a lovely eggplant creme, opaque in two coats. It was lovely, but it lacked a certain pizazz. Enter m79 and the Sally Hansen Color Quick Purple Chrome. Squee! I love this so much! Apologies for the blurry shot. Also, the deep shine? Seche Vite, baby! Winner, and still champion of the top coat battle. 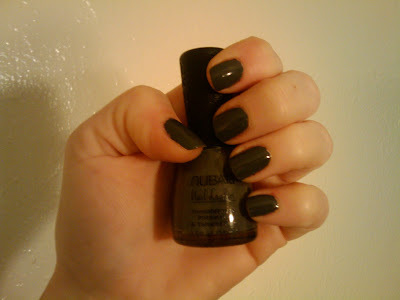 I've had Nubar's porcelain base coat and Diamont for a while, but haven't been using them. I finally broke down and ordered a color from their new Fortress collection. Because I really *heart* grey polishes. 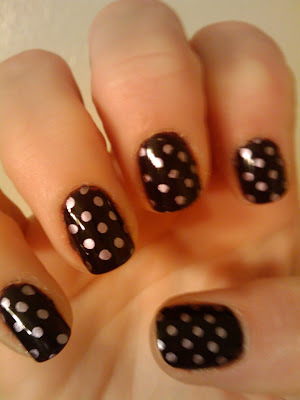 I will tell you that I still prefer Seche Vite top coat, even if it does shrink a little. I started with two coats of Stronghold. It's gorgeous, and it's pretty much opaque on the first coat, but I did a second coat to ensure no streaks. There was a little naked nail on the first go around. I liked it, but I also wanted to play with the Konad. It was grey and rainy, so I went with silver clouds. Ooooh. Aaaah. I did use Diamont over the Konad. I also sat for 30 minutes while it dried completely. I actually wore this one on St. Patrick's Day, as an homage to the colorblind. 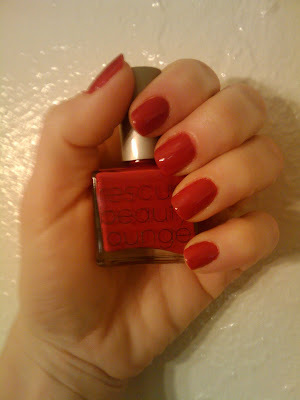 Also, I really, really, REALLY like this red. It's creamy, and opaque and totally works with my weird pale, yet still olive skin tone.